Throughout my life, I had the pleasure of being involved with different forms of entertainment. I studied playwriting in High School, worked as a film critic in my first year of college and now I am immersed in video games, a passion that started late in my life, at the age of 17, but only blossomed as the years went by. When I first experienced interactive storytelling, I realized video games hold great potential to become the ultimate platform for narrative-driven experiences, in both depth and meaning, surpassing films and books. The prime example to support my reasoning is Ken Levine developing a story that can only be told through video games. 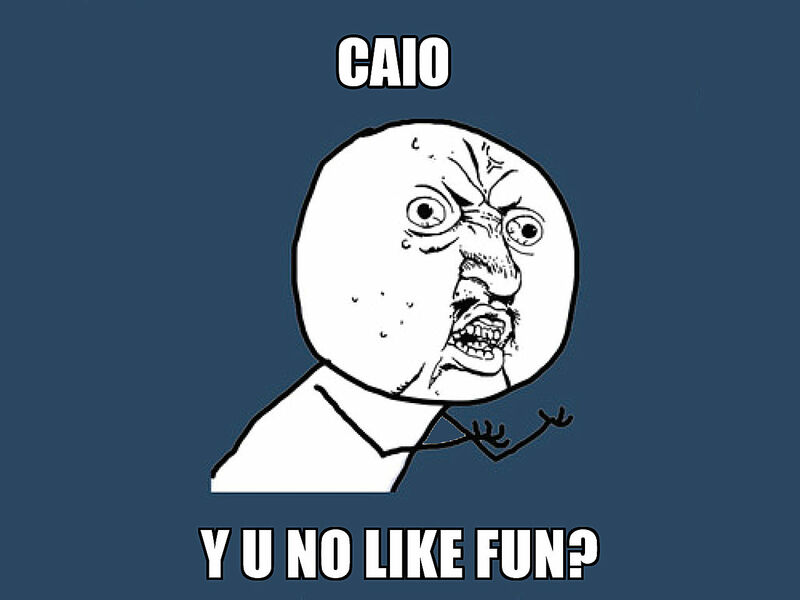 Moreover, games, through interactivity, can engage their users in a way that no other form of entertainment can. With this in mind, game designers have started to use their skills, in order to create experiences that motivate individuals to tackle real life problems. Games can be a powerful tool for social change, as Jane McGonigal detailed in her New York Times bestselling book Reality is Broken: Why Games Make Us Better and How They Can Change The World. 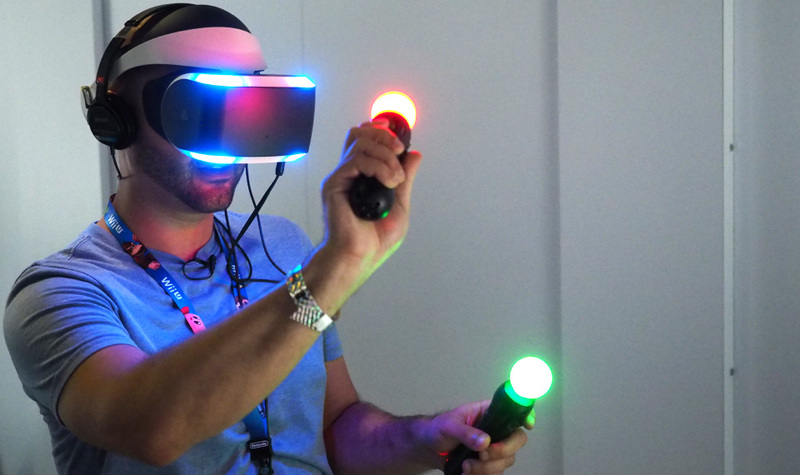 The future for gaming seems bright in various fronts. This industry continues to become more sophisticated each year, developing deeper and more engaging experiences and as the development curve for video games remains steep, the revolutions we are witnessing today are only the beginning. While I love video games in their current form, the future of this medium is what excites me the most about it and also what makes me place games above all other forms of art. However, as in any relationship, I may have to reevaluate my judgment over video games if certain expectations are not met in the long run. With this said, I compiled six future scenarios that, in conjunction, would make me give up on placing the video game industry on top of my priority list. As technology continues to grow in an exponential rate, new gadgets and novel ideas are created each day and the time spam between the development of one innovative product and another is getting shorter, due to a principle known as Moore’s Law. 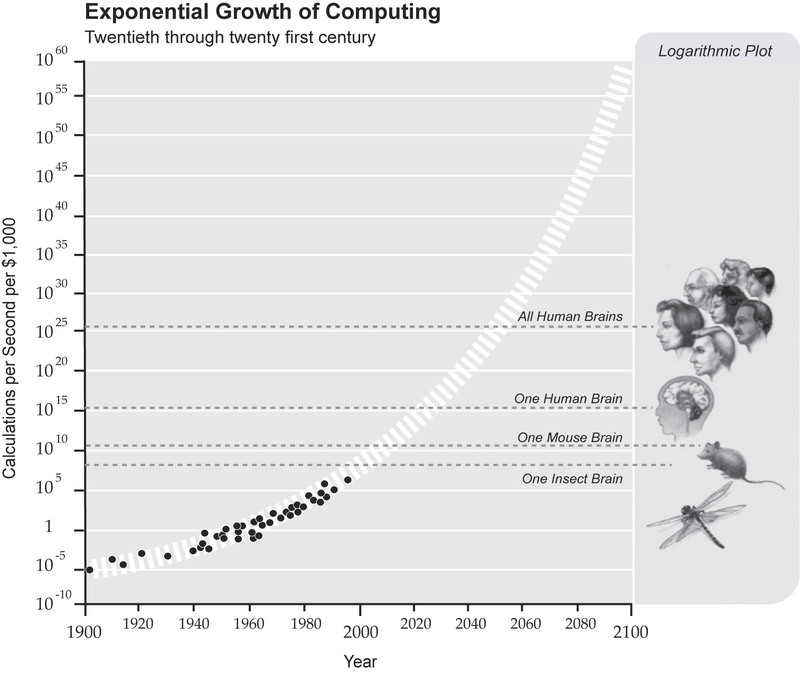 This concept states that technology doubles its processing power every two years, as seen in the graphic below, designed by Singularity University. Video game studios keep a close eye on the technological market, in order to spot opportunities to implement new technologies in their productions and gain an advantage on the competition. The current example of this process is the expansion of Virtual Reality. I fear; however, for a future in which the time between the arrival of one revolutionary product and the other continues to get shorter, to the point that developers will not have enough time to fully explore one technology, before moving on to the next "big thing”. If this scenario comes to fruition, it will hurt the innovation this industry can deliver, as developers will not be able to explore a technology to its limits. Considering that I place the gaming universe on top of my priority list due to what the future holds. Lack of significant innovation is a scenario that could make me shift my focus towards other mediums. 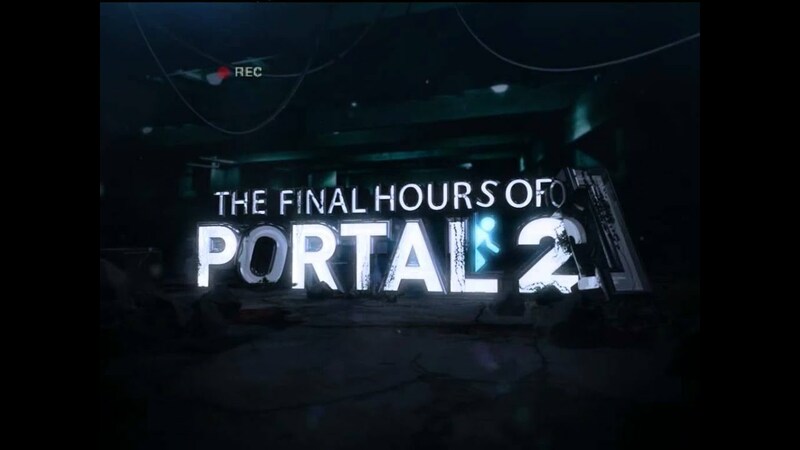 The Final Hours of Portal 2 (above) is an e-book written by the video game journalist Geoff Keighley, in which the author details the development process of Valve’s Portal 2. Therein, Geoff reveals the story behind the origins of the game, and how the initial concept diverged from the final product we all go to know. 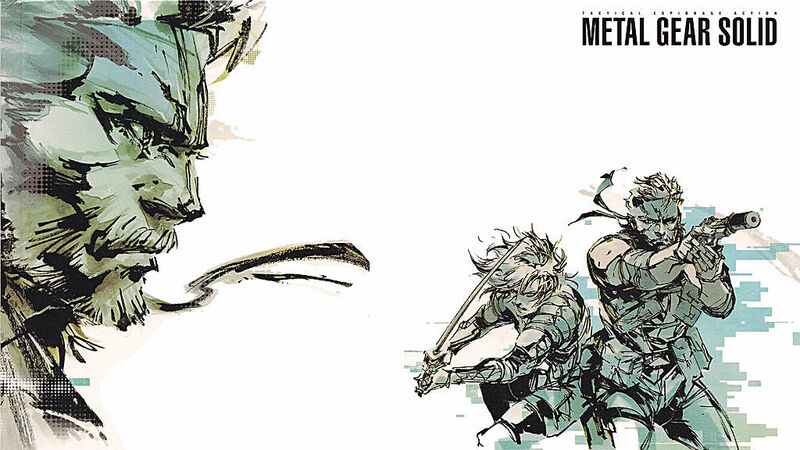 The original premise of the game featured a counterintuitive concept. In an attempt to innovate in their design, developers at Valve produced an early version of the game that did not feature portals and included a much different story. The codename of the project was F-Stop. 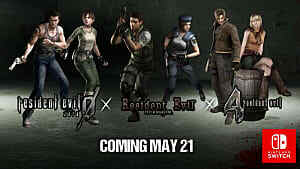 The development team; however, realized it had moved too far away from the essence of the franchise. Acknowledging its mistake, Valve restarted the design of the game and Portal 2, in the form we all know, was born. 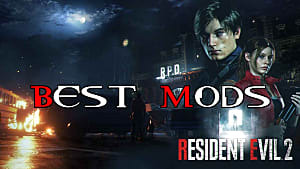 With acclaim from both critics and fans, scoring 9.5/10 on Metacritic (PC version), Valve managed to transform its bad start into a masterpiece, but not every developer can accomplish this feat. A prime example is the Call of Duty franchise. 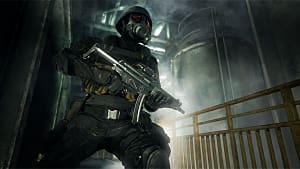 Through the years, players complained that the series had become too repetitive and when the minds behind it decided to alter their formula, the fans reacted negatively to the change. I am referring to the latest entry of the series, Infinite Warfare. Enthusiast asked for change and when they received it, they complained. This may seem as a paradox, but the issue was not the change itself, but how it was delivered. It was so drastic; that the essence of the franchise fell into oblivion and this resulted in a lesser product in the eyes of the players. Without following the identity of the series, it was not a surprise that the sales were 50% down from Call of Duty: Black Ops III. In the years to come; however, this issue might not be exclusive to Call of Duty. The problem of lack of identity might spread in the video game franchises of the future. 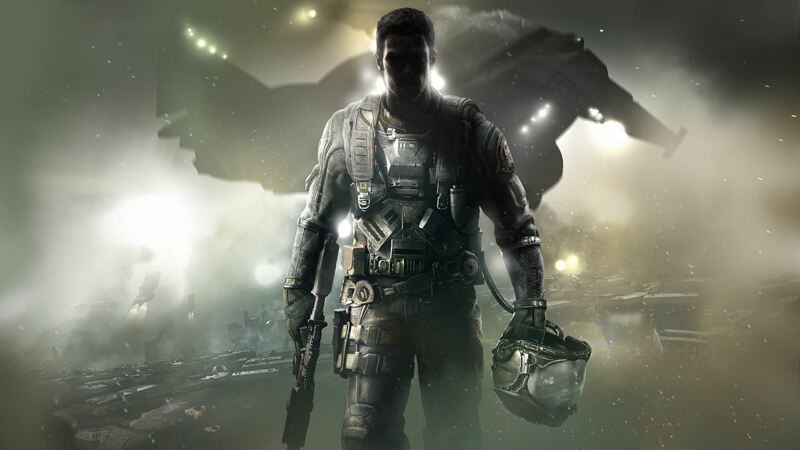 As developers have at their disposal an increasingly large set of technological tools to work with, the problem of Call of Duty: Infinite Warfare may affect the video game industry as a whole in the future. In tandem with Reason #1, I fear for a future when developers attempt to harness the potential of several technological innovations at once and by “shooting at every direction”, the essence of long-standing franchises might be lost. Resulting; therefore, in a less engaging experience, which aspires to be many different things at once. However, it ends up pushing too hard towards innovation and failing to preserve what made it special in the first place. 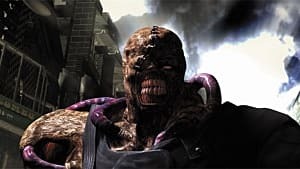 Video games have delivered masterpieces in regards to writing, The Last of Us, BioShock and Mass Effect, to name a few, but these are the exceptions, unfortunately. The overall standard for writing in this industry is considered low, if compared to other forms of entertainment, such as films and books. The video above, from the YouTube channel Extra Credits, gets into further detail as to why the gaming industry often delivers poor narratives, but the biggest factor is the working conditions under which writers operate. In many games, developing a narrative comes as one of the last steps in the development cycle, which means the writer needs to construct a story for a game that has essentially been already built. With this said; video game writers usually need to face the frustration of having their imaginations limited by the constraints of the project, needing to adapt their ideas to a game that has been presented to them. This scenario limits the artistic freedom of writers and hurts the quality of their work. 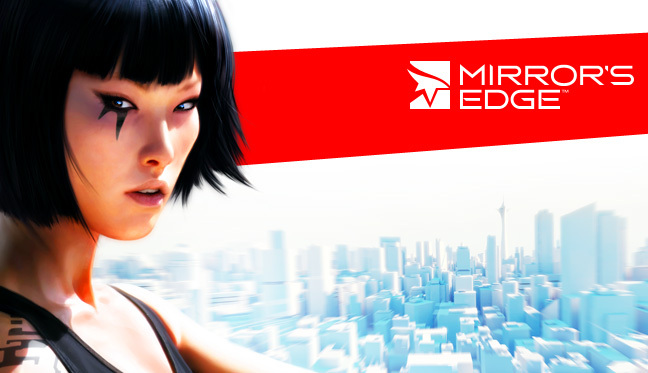 The most notable example of writers delivering poor narratives as a consequence of the constraints of the project is the original Mirror's Edge game. In 2011, the writer of the game, Rhianna Pratchett, spoke to the website ActionRip and commented on the reason why Mirror's Edge lacked a compelling narrative. "DICE was a great company to work with, but Mirror’s Edge was a challenging project and an important learning experience for me. Unfortunately, because of the timing when I was brought in and a large amount of the script being cut (due to the late decision to remove level dialogue) the narrative wasn’t what I would’ve liked it to be. Thankfully, I got the chance to remedy this a little bit in the Mirror’s Edge comic series with DC. The story in those was much more along the lines of what I would’ve liked to have developed for the game." This is the opposite of the working circumstances in other mediums, such as television and film, where the emphasis is in the narrative and all of the rest is built around that. This trend in gaming is changing; however. Some studios now have full-time writers as part of their design teams. These include BioWare, Ubisoft and Valve (above) and they aim to develop the narrative of their games since the initial concept, finding the best methods to combine storytelling with gameplay, in order to ensure both work together and deliver an optimal experience. This shows a commitment from these companies to deliver compelling narratives and it represents the recognition that a good story is a fundamental piece to make a game be successful. It is my hope to see more studios adhering to this modus operandi of placing more emphasis on writing and holding it as a crucial element of the experience. Narrative design is a key component of the game’s design, after all, but whilst this industry has improved significantly from its roots, there still is plenty of room for improvement. 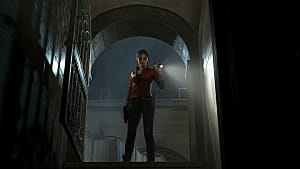 Developers are still discovering the language of video game narrative and this process of attempting new techniques, especially in the indie scenario, excites me, due to its potential to deliver more compelling and emotionally provoking experiences. Considering the potential video games hold for storytelling, and given my passion for the art of telling stories, if the development curve in the evolution of video game narratives cease to be as steep as it is now, this will demotivate me to keep my excitement over the future of this industry. Video games have come a long way since their conception, but they still have a long way to go. In order to improve the experiences of today and perfect the ones of tomorrow, we must learn from the past. For this purpose, case studies have been created around games that are the best this industry has to offer to date, in order to understand what made them so special, but not everyone agrees that we should study games in depth. Two years ago, I watched a video posted by the YouTube channel Extra Credits titled “Art is Not The Opposite of Fun” (above). As video games continue to become more complex, a worrying trend also emerges. A portion of gamers believes that making a deep analysis of the products of this industry will make them worse. They claim video games are meant to be fun and studying them, in order to craft deeper experiences and develop their potential as a form of artistic expression, would hinder the fun they deliver. People perceive art as something boring or weird and some gamers fear that making games become more artistic will lessen their fun. I must say, unfortunately, that I have witnessed this trend occur with my friends. In many occasions, when trying to talk about a game in a deeper sense, my peers would simply say, “it is just a game”, in an urge for me to stop “overthinking” about it. If I speak about the potential games have to deliver experiences of art, people automatically assume I wish to make games become as boring and weird as people perceive art to be. The image below portraits the reactions I get when I mention the development of games as a form of art. “It is just a game”, this assumption needs to go. We cannot demand better experiences if we, as a community, are not willing to mature along with this industry. The games designers create are a mirror that reflects us. 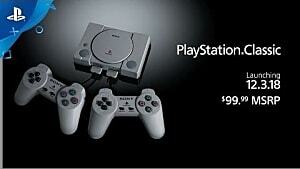 They want us to buy their games; therefore, they create products to suit our needs. With this said; if we are to ask for better content, we must grow together with the industry and attempt to discuss our games in a deeper level and that means embracing the possibility of having games as an artistic product. Creating more artistic games; however, will not be easy. As Reason #2 stated, players can react negatively if games change in a way that makes them loose their essence, as happened with Call of Duty: Infinite Warfare. With this said, the trick to making games mature as a form of art, without making them lose their fun, is ensuring that developers do not deviate entirely from what makes games special today. Aiming for the future, whilst staying true to the past of games should be the goal of developers, so they may deliver productions with great artistic value, that are still fun to play. But as the video from Extra Credits explains, there is a hidden reason as to why many gamers vilify those who study video games in depth. They do not want games to change. 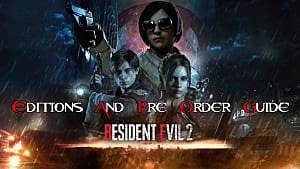 Many gamers love their favorite titles so much that they want them to remain as they are forever and as developers study new ways of delivering experiences through gaming, some gamers fear that the aspects they cherished dearly in their favorite titles will be a part of the past, buried seven feet under. Whilst this is a comprehensible concern, we as an industry must acknowledge the potential video games hold for the future and unfortunately, techniques from yesterday may not entertain the audiences of tomorrow. We must learn from the past, but never copy from it. We shall adapt what made games great today to the new reality of the future that is yet to come, but in a careful manner, so we do not lose the essence of gaming. We must evolve from where we stand, rather than creating something new. This will be achieved through discussions on the topic, among professionals from AAA companies, indie studios and gamers, who should not think that games are “just games”. AAA studios spend time and resources, in order to learn as much as possible about the art and science of game design. but if their target audience continues to diminish their efforts and they do not make a significant impact in revenue, studios may downscale these researches and progress in this industry may become stagnant. Given that the biggest factor that compels me to video games is the prospect they possess, if this scenario occurs, I may have to reconsider what my favorite form of entertainment is. 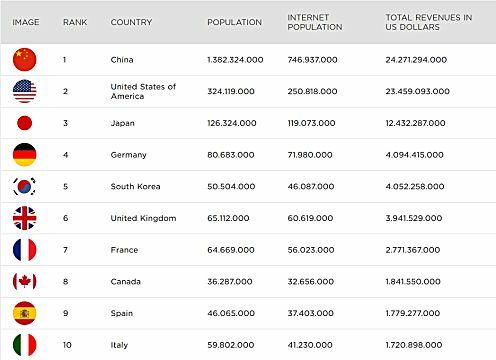 It is possible to see that the top ten rank is populated exclusively by countries from Asia, North America and Europe and it is no surprise that the major AAA studios in this industry are located in these continents, but other contenders are appearing quickly. 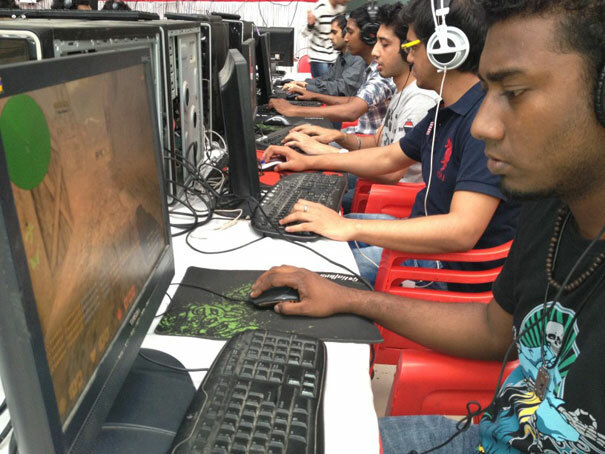 India, Brazil and Russia are examples of emerging markets in the video game industry and their indie scene is growing rapidly. Due to the expansion of the middle classes in these nations, more people have gained the financial resources to afford a computer and work on a game with their peers. Yes, it does and a lot. The emergence of these economies can bring plenty of benefits to the video game industry. The countries mentioned herein have cultures that differ vastly from the nations that dominate game development. Individuals from these emerging markets have a different perspective over the world, due to a different culture, and this influences the products they create. The different culture and set of beliefs from these developers in emerging countries makes them tackle different themes and explore new ideas, because they look at games through a different set of lenses. Every gamer benefits from this, because this growth of the industry in emerging nations will allow players from all over the world to enjoy new experiences, themes, ideas and a more culturally rich industry. The best example of cultural plurality benefiting the video game industry as whole was the development of games in Japan and how they differed from the games designed in the United States. The video game industry in American soil develops mostly FPS games, in which the gun is seen as a tool to empower the player against the foes. In Japanese productions, on the other hand, a gun is perceived as an extension of the character and used as a mean to escape from a situation where everything went wrong. In Japan, the gun is a last resort. This occurs due to a difference in culture. In the United States, guns are seen through the lenses of soldiers, whereas in Japan, they are perceived under the philosophy of the samurai. 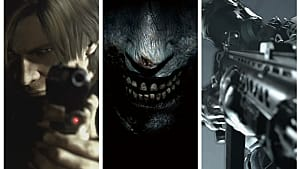 With this reasoning, Japanese developers created games such as Resident Evil, Silent Hill and Metal Gear Solid (above), each of these productions representing a revolution in the industry. 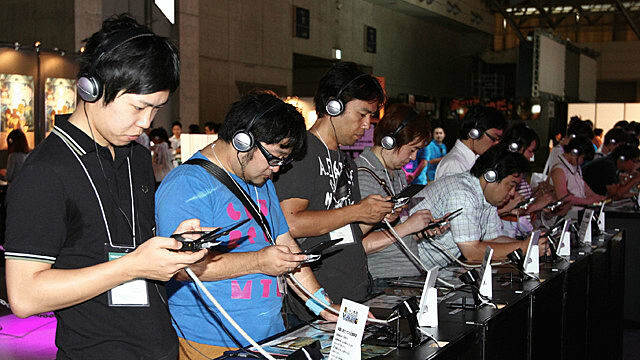 If Japan had not invested in video games, many contributions of this country to this industry would not have happened. 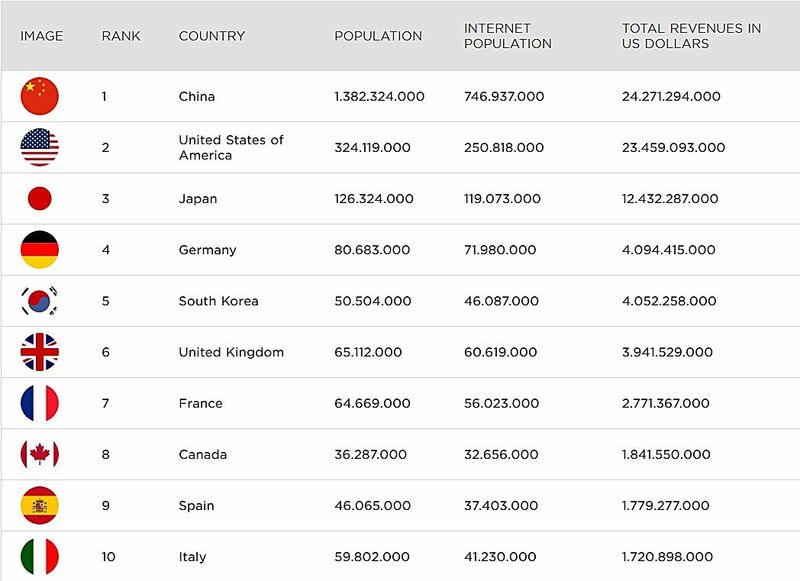 Now, imagine if more countries start to emerge and establish video game studios. In the future, we may see several revolutions in this industry, as developers from various part of the worlds, with different cultures, would look at games in a different manner, as happened with Japan. The biggest concern for this future; however, is politics. 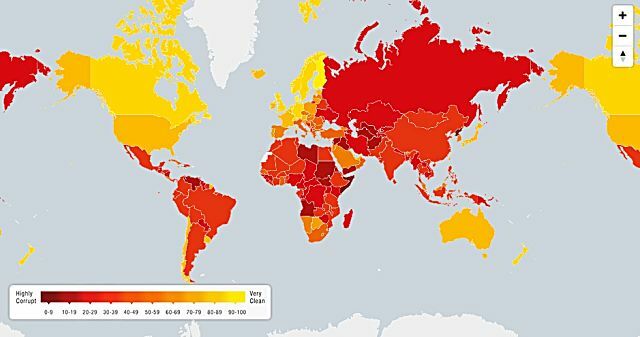 In emerging nations, unfortunately, corruption rates are very high, as seen in the map below, presented by Transparency International. In the emerging countries, a corruption scandal can suddenly become public and change the entire governmental structure. Despite living in the USA for a period of my life, I was born and raised in Rio de Janeiro, Brazil, where I currently reside. Our former president, Dilma Rousseff, lost the presidency after a political scandal, being accused of improper use of government money. After the current president, Michel Temer, took control, the direction of the country changed drastically. As everything may change with the blink of an eye in developing countries, due to the corruption levels thereat, the promising landscape of the middle class and the video game industry in these locations may shift suddenly as well and not for the better. 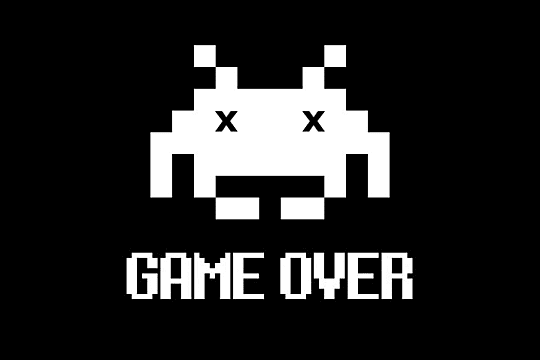 With few unfortunate moves, a government may wither the development of the video game industry in its soil, by halting the social progress done in the last few years. It may happen in Brazil, as Michel Temer promises to cut social programs, which were intended to allow the population to raise above the poverty line. This can happen in Russia, India and any other developing country, where instability rules. The middle class in these nations progressed quickly, but it might go the other way around just as fast, depending on which way the wind blows in the government. I dream of a future in which the plurality of cultures making video games increases significantly; however, the political scenario might shift in a manner that stops the progress of the gaming industry in developing countries. If this occurs, we may never see the cultural diversity they would bring to this industry and this lost potential could demotivate, because the future I envision would not happen. If you are reading this article, it means you have an interest in the video game industry and there probably has been people in your life who have claimed that gaming is a fruitless activity; a waste of time. Luckily, not everyone adopts this reasoning. Some individuals recognize the superb job video games have done to retain the attention of their users. Some people even go further and reckon that video games have potential to save the world. In your job or at school, you have probably felt at some point that you could not clearly see the reason as to why you are performing certain tasks. You perhaps felt demotivated to go on. If you felt this way, you are not alone. According to Forbes, most Americans are unhappy at work. The reason varies from not seeing the impact their jobs have, to a detachment from the mission of the company. Video games; however, are on the opposite side of the trend, as they continue to become increasingly more engaging, but playing a game consists of completing tasks, as in a real life job. With this said, what makes people become attracted with doing virtual work, whilst they become more dissatisfied with their real life jobs? In a video game, players feel empowered. They relate with the objective of the experience and most importantly, they receive a clear an immediate feedback upon completing a task. They see how their actions influences the virtual universe around them. They have a clear sense of progression. This motivates players to continue. In real life, there is no such thing. Reality is broken. In her book Reality is Broken: Why Games Make Us Better and How They Can Change The World, Jane McGonigal tells how we can craft a better world through gaming. In her piece, she shares the techniques game designers use, in order to motivate players to become engaged in a video game. Her objective is to apply these techniques to real life situations, so they become more interesting and people become happier with their endeavors. Using concepts from game design in non-game contexts is known as Gamification and it can be used to motivate people to engage in various activities, including those that can help others and save the world. In 2007, McGonigal released an Alternate Reality Game, called World Without Oil. It was an experiment in which users needed to imagine themselves in a world suffering from a sudden oil shortage. We can see examples of video games causing positive impact even when they do not have the intention. The prime example is Pokemon Go stimulating sedentary individuals to go for a walk and sometimes even aiding to treat depression. The trend of using gaming for social good may help the video game industry to cleanse its reputation of “fruitless”, whilst actively changing the world. This premise should excite every gamer, but if it fails to continue, it might demotivate me to stick with this industry. It is my sincere wish to see the video game industry thrive, for I believe it holds enormous potential in the areas mentioned herein and many more, which I did not cite in this article for the sake of its length. While I enjoy the games of today, what makes me place video games on top of my priority list is the bright prospect of this industry. If for some reason, the brilliant future of gaming does not occur, I will continue to play, but my perception of this field as the ultimate entertainment platform will most likely change.